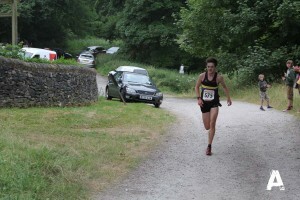 It was a first for Tom Saville, as he crossed the finish line in a senior fell race for the first time. We all know the eighteen year old has a turn of speed and in this race he also demonstrated he can run with a cool head. Race Sensibility usually comes with race experience… This is Tom’s story of his race. I’d never done this race before as I wasn’t old enough, apparently I still didn’t look old enough as I got mistaken for being in the junior race on my warm up. But anyway, I spent a significant amount of time trying to memorise the race map at the start so I had a rough idea of what to expect. On the start line I didn’t have any real expectations except to run to my best ability. I was having a good laugh with Chris Shelton and Stu Walker but I had noticed some other lads my age that were pretty quick and they were my ideal targets to race. It was all go from the off and Stu along with the other two lads took off at a incredible pace, however I was told by several people (Including Chris and the course record holder Stuart Bond) that the first hill was a killer and not to set off too fast, so I sat in about 7th ish just behind Chris. As we approached the first hill Chris and I saw that one of the lads my age, Jack Ross, was leading and Chris and I had a bit of a chat about how we thought he’d set off very quickly. We continued to talk all the way up to the lower slopes of the hill, which we think annoyed the guy just behind us quite a lot (sorry about that if you’re reading this). From there on we split up a bit and I settled into a nice steady rhythm up the hill, not catching on the lead three but not dropping back either. I maintained roughly the same gap all the way to the first summit and gained a bit back on them on the decent, probably because I didn’t have to look for the tapes to follow whereas they did. Towards the summit of the second climb I put some effort in to catch the leaders and just got to them by the top. At this point I didn’t feel strong enough to take the lead and just hung on the back of the group. The road section, which for me marked roughly the half way point, felt hard and the pace seemed to really shoot up. I’d noticed we’d dropped Stu, leaving just us three under twenties (Jack, Bertie and me) to battle it out. As we got on to the single track section the pace had started to slow but I still didn’t feel good enough to take the lead, plus there was no way of getting past Jack on the narrow track. Soon the single track path was more open and Stu had nearly caught us back up so I decide to take to the front and try and open up a gap. I love running on twisting single track and so thought it was a good place to push the pace up. The adrenaline of leading a senior race overall may also have contributed to my speed. Soon me and Bertie were on our own out in front and coming up to the final climb I was beginning to wander how much he had left in his legs and if he was going to just suddenly fly past me. I did know he was quick on the road. The steep ascent from the stream up the final climb seemed to be my only chance and I maintained my pace. This put a small gap between me and Bertie. I kicked again at the top in an attempt to gain as much distance I could on him before the road. From there all the way to the finish I was running on the adrenaline of winning my first senior race but was constantly listening out for the sound of someone coming up behind me on the final road section. The cheers at the finish just made me run faster.d and with the race being a road finish though the village I ideally needed to drop him before then. As this was my first overall win I didn’t really know what to do at the finish so I just limply put my arms in the air as I crossed the line, I probably just looked a bit confused to be honest but never mind. Great race, great course and great competition.